Hiroshi Mori was born in Hyogo Prefecture and has lived in Osaka, Sendai, and Ome (Tokyo). A retired engineer, he has a background in solid state physics and optical engineering. 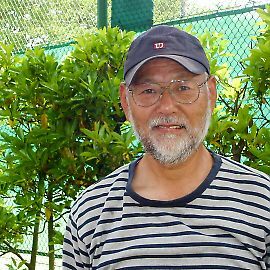 He currently lives with his wife in Hanno City (Saitama Prefecture); they have four children. Hiroshi enjoys listening to blues, gospel, and jazz. He also plays tennis, and he's a baseball fanatic. Since childhood, his favorite team has been the Hanshin Tigers, because the team is based in Hyogo. Hiroshi edited Eve's book Crazy for Kanji: A Student's Guide to the Wonderful World of Japanese Characters. He also edited each of her 151 Kanji Curiosity blogs. When he considers kanji, he always marvels at how clever and imaginative the ancient Chinese were. His favorite compound is 憂鬱 (ゆううつ: depression) because it shows just how complicated characters can be. He comments, "I may never learn how to write the second kanji."